Does anyone remember a musical instrument shop located on the corner of Bishop Street and Leicester Street. Above this shop a Dancing School called Rosean School of Dancing did its lessons. I was a member of this School and wondered if there was anyone out there that was also a member. It was mentioned here earlier in this thread about record shops. How many of you remember the good times had at the Locarno? My favourite years were 1963 to 1968. Can you remember the groups that played every Saturday and Wednesday. A favourite of mine was the Ross Mitchell Trio. What memories. I worked at the "Rock House" in the late 60's - early 70's. I remember some good bands appearing there. My claim to fame from the Locarno is, I served all the members of the Tremeloes with drinks! Yup, as the relatively unknown "Brian Poole & The Tremeloes" they once stopped-off at the Mermaid Inn in Gosford Street for a drink. Slightly taken aback by their appearance, the landlady ('Mabel') asked them who they were to which Brian Poole replied "We're a pop-group". Unimpressed with showbiz celebs the landlady said to them "I've never heard of you?" to which Brian Poole calmly replied "You will!". 'Mabel' never stopped telling that story after they became famous. I loved the Locarno. It must have been about 1960 when I first went there. I used to go nearly every Saturday and Wednesday (on Wednesday it was the over 21s and although I was 17 I used to get it - must have looked old for my age dressed in stilletoes and dresses with hoops or net underskirts to make them stick out). I sometimes went on a Sunday and seem to remember that you had to be a member of the Sunday club. I also have fond memories of going dancing at the Police Station. As it didn't have a bar the lads used to get their ticket early and then go to the pub, returning after 10 pm when the pubs closed. Hello Tricia. I bet you remember the long queues to get in. My earliest memories were for 3pm on Saturday afternoons where the queue stretched around the end of the M&S store. (I was young once) I bet you were a cracker, just like you no doubt still are. Thanks Philip. Happy days and happy memories. My wife remembers the Police Ballroom. She recalls that it was 5 shillings to go in and there being no bar. 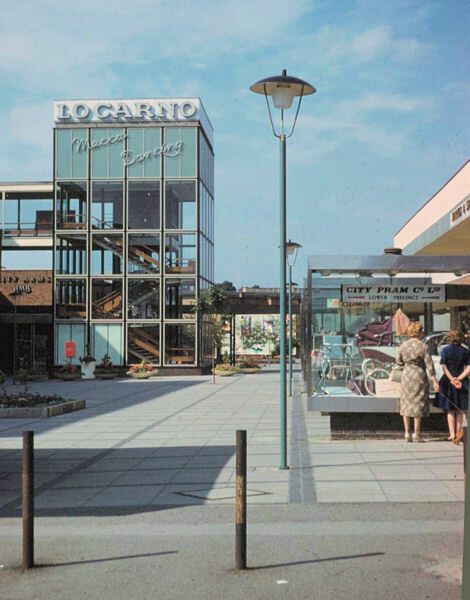 The Locarno 'Atrium', Smithford Way, Coventry in 1961 � Copyright Geoff Royle and licensed for reuse under this Creative Commons Licence. If my memory serves me right? in the 2nd year at Freddies (1960/61) someone from the Locarno came to the school giving out free tickets to kick start it. For my age group I believe it was on Tuesday night, but for me it became a three night a week must. I also found out I looked older than my age (it also helped by me knowing the main "bouncer". his day job was a driving instructor). He kept quiet when he seen me, lol. Happy days. The Mercia School of Dancing was owned and operated by Hetty Armstrong. It was located on the top floor of New Buildings (above the Exchange & Mart). I am looking for photos of the school and hope somebody out there has some and can add them to a reply. Any other recollections would be interesting to read. I attended there from 1970 to 1973. Thanks. I'm sorry I can't help you with the Mercia School of Dancing but I remember the dancing school in New Buildings. I used to have dancing lessons at the Alf Kendall and Hetty Armstrong School of Dancing in the Centre Ballroom (later became the Berkley Grill) in Holyhead Road. This would be around 1954.